000webhost is the best free web host service provider and offers you a handy tool which is the auto installer. The auto installer is very easy to use with just a click it installs the whole system which improves your website with the forum or gallery with only a few clicks. Some of the popular scripts are WordPress, Joomla, Drupal, photo gallery, OS Commerce, and other famous scripts. WordPress is a handy tool which will help to host your website by customizing and editing as per your needs without involving or hiring any paid professionals or even requiring for someone to code, It has so many Features, and with extensions, one can improve the website functionality all that by using the WordPress on 000webhost.com. Here, WordPress is a very popular blogging site, and it helps to add various themes and customize your whole website making your website look good. WordPress themes allow you to change the way and design your webpage looks with colors, page layout and even add fonts with a varied collection of themes and also you can customize the WordPress by changing the site identity, Adding a lovely background image which will suit your needs, and even add menus. WordPress is open source software which you can use it for plugins, themes and add widgets which can be added to your website to improve the look and feel of the website. WordPress makes it easier to build your website like the way you wanted without any need for coding skills. You might want to create a business website, an online store, or even a site for the subscription. WordPress also makes it easier for you to add your PHP code and modify themes using CSS. At WordPress dashboard you can able to control and manage the whole website easily, whether if it is adding a new page, using widgets, checking or approving comments, and even change themes, everything can be done via the inbuilt dashboard on WordPress. You can easily customize your website with themes, adding colors, changing the way page looks and even good looking fonts. To control and change WordPress themes, find appearance and themes in the wordpress dashboard and to change to the new theme, choose to add a new option, and it will navigate you to a place with the collection of themes from there you can add various filters and even use the search to find your theme. You can also check the theme which you applied using the preview button and finally press the install button to make final changes to your website. Now after changing the theme successfully, you could also further enhance the look of the website by further making new changes using the Appearance menu on your dashboard and by clicking the Customize option. You can able to control the site by changing the website identity, color, menu, widgets and even change the background image of the website to suit your needs. By installing plugins, you can improve the functionality of the website with new features and improvements. These plugins behave like extensions which help to do Social media sharing with just a click of the button from the website or make your website more secure from attacks and seo optimization to make sure that your website ranks first on Google search. You can able to add new extensions or plugins in the WordPress dashboard by navigating to plugins section and then clicking add the new button, and from there you can choose from the various collections of plugins which are categorized under featured, recommended, favorites and finally the popular ones. You can also search for other Plugins using the search field of your choice and now to install the plugin; you need to click install now and then activate it by pressing the activate button. You could also add your plugins with the help of Upload Plugin option, and that will enable you to upload your favorite plugin of your choice to get added on the website. You can control all these plugins via the dashboard, and that makes it easy to manage every function which is attached to your website. WordPress allows extensive control over the layout of the webpage and also manage the content on the website very effectively and quicker than usual. You can able to access the widgets by navigating to the dashboard and finding it under the appearance option. From there you could find the various lists of widgets, and you must already have some widgets in there which includes the primary sidebar, footer widget area and also the content sidebar. You can also find and evaluate the use of the right theme so you could fit in the much higher number of widgets on your website. WordPress allows you to add a new widget by simply needing to expand the area wherever you want the widget to be and by dragging and dropping the widget where you want it to be, and clicking will save your widget. You can also remove your widget from the webpage by clicking the widget and dragging it away from that place which will automatically remove the widget. To add your widget, you can also add a plain text widget and add some text to it or else add some HTML code to make your widget. When you use 000webhost, there is no hidden cost and no other unknown terms and conditions involved. It always stays fastest, with maximum reliability, good user support and other features with the free web hosting service it provides. 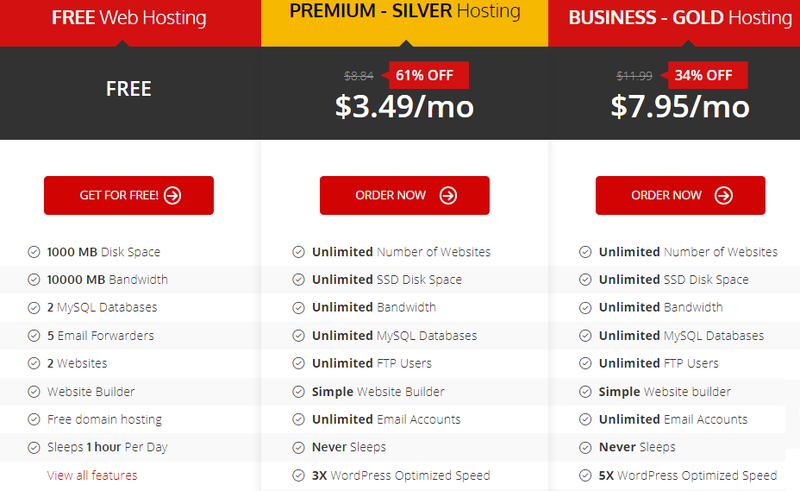 It is even better than paid services, and there is no need to go for the paid services when this is entirely free webhosting.